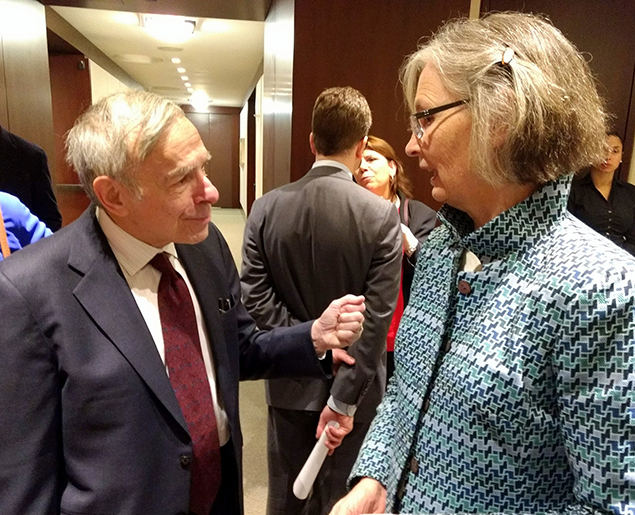 On March 28, 2018, JALBCA sponsored its 22nd Annual Ellen P. Hermanson Memorial Symposium, entitled “CANCER AND CAPITALISM: Who Will Stand Guard in the Cancer Wars?” Although there have been exponential advances in molecular science and development of targeted therapies in recent years, government support for medical research (particularly funding to the National Cancer Institute) has diminished significantly over time. As a result, the fifty/fifty financial partnership which existed between government and the private pharmaceutical industry has devolved into an enterprise dominated by private enterprise. 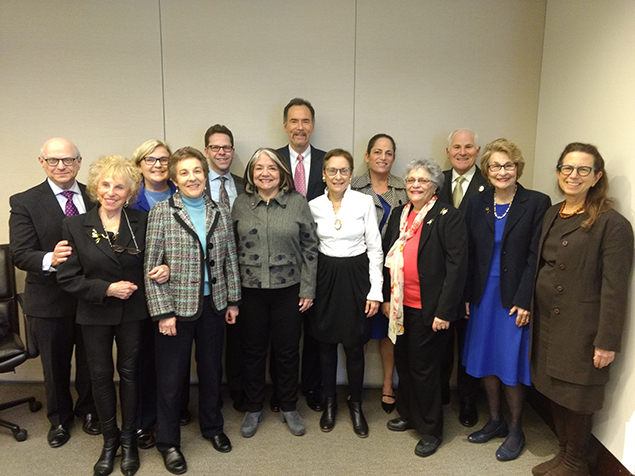 The Symposium sought to explore the impacts of this shift and the conflicts of interest raised by industry’s control of research on potential cures. Co-President Luisa Kaye opened the program, which was moderated by Former JALBCA Co-President Hon. Helen Freedman (NYS App. Div. 1st Dep’t, retired). The panel of judges consisted of Hon. Ellen Gesmer (NYS App. Div. 1st Dep’t), Former JALBCA Co-President Hon. Karla Moskowitz (NYS App. Div. 1st Dep’t, retired), and Hon. Alan Scheinkman (Presiding Justice, NYS App. Div. 2d Dep’t). The expert panelists at the Symposium included Larry Norton, MD (Deputy Physician-in-Chief for Breast Cancer Programs, Memorial Sloan Kettering Cancer Center), Mace Rothenberg, MD (Chief Development Officer, Oncology, Pfizer Global Product Development, Pfizer, Inc.) and Fran Visco (President, National Breast Cancer Coalition). Dr. Norton both served on the panel and, in addition, provided introductory remarks on “where we are” in the battle against breast cancer. 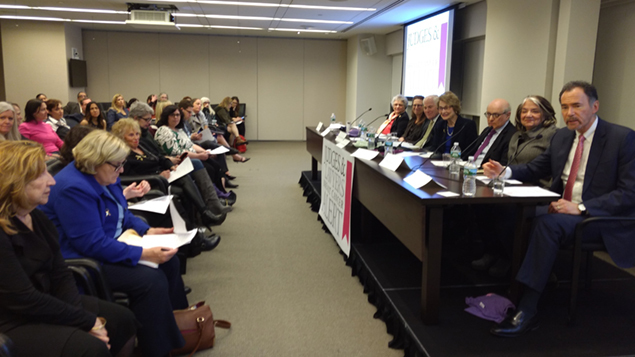 The Symposium sponsor was The Ellen P. Hermanson Foundation and several organizations also participated as supporting organizations – the National Breast Cancer Coalition, the New York City Bar Association Health Law Committee, the New York State Bar Association Health Law Section, and the Women’s Bar Association of the State of New York. Dr. Norton provided a summary of progress in cancer research during the prior year. He explained that, while there have been advances in molecular medicine, precision medicine and immunotherapy, researchers were waiting for the pieces to coalesce. While there is a great deal of knowledge and data, there is a need for concepts to be developed that could use the data. He also noted that there has been a great deal of growth in the development of immune checkpoint inhibitors – in the immunotherapy area – however, immunotherapy has had disappointing results in breast cancer. On a hopeful note, Dr. Norton said there has been an explosion of progress in developing “reverse resistance to other drugs”, i.e., drugs which challenge the chemicals that cause resistance to cancer drugs. Dr. Norton expects the most progress to come from making existing drugs work longer and better, rather than from the manufacture of new drugs. This, ultimately, would advance breast cancer prevention or treatment as we gain a better understanding of the disease and treat it earlier. Dr. Rothenberg noted that maintaining a focus on what collaborating parties stand to gain financially, may overlook other potential conflicts that arguably serve to influence a research project. For example, the investigator’s academic pursuits (e.g., career advancement, peer recognition, etc.) and reputational benefits might inure both to the institution and individual investigators and may influence the scientific work. Dr. Rothenberg states it is also important to distinguish COI further – within an entity, and among collaborating entities. In an academic-industry partnership, an example of a conflict is the decision related to the timing of public disclosure of research information. Dr. Rothenberg refers to this as “proprietary” conflict. An academic investigator may wish to accelerate the sharing of such information within the scientific community for the greater good and for personal recognition, whereas an industry partner may evaluate steps to be taken (if any) to protect intellectual property rights in advance of public disclosure. In addition, if a research project is not destined for greatness in terms of a medical breakthrough, or has features that would prevent its successful progression in terms of development, the industry partner, guided by the obligation to stop investing in such a project, will redirect resources elsewhere. In contrast, the investigator may wish to press on with the study of a particular compound, even though it may never become a marketed medicine or therapy (or, for that matter, produce a high-market share product). The road to bringing new medicines to market is complex. It generally does not involve a robust and transparent exchange of scientific information. In other words, there are constraints which necessarily attach to industry (in particular, a fiduciary duty to shareholders which impacts on marketing decisions and drug development). The public, as a stakeholder, arguably has little standing. The process of bringing a new drug to market often takes many years and is the culmination of discovery research, pre-clinical testing, medicinal chemistry, clinical development, and regulatory review. The Bayh-Dole Act may enhance drug development, by financially incentivizing academic institutions to bring their best investigators to the table. Conspicuously absent from the academic-industry partnership, however, is the collaboration of government scientists (such as from the National Cancer Institute – National Institutes of Health)⁵ – and all this, of course, excludes a government say in drug pricing. Nevertheless, NIH awards billions of dollars in research grants — $17 billion in 2016 alone.⁶ Yet, 5% of clinical studies terminate without generating any data (id.) and often without required reporting on the NIH website. ⁷ NIH, therefore, has instituted new rules for funding research in the hope of promoting transparency and the dissemination of information. These rules cover human, clinical research funded, in whole or in part, by the government and require negative as well as positive results to be reported. The goal is “Open Science”. It is hoped that openness will foster reproducible results (something necessary for good science); promote more ethical reporting in that the results will have to match the questions originally posited in the original, registered trial, and force researchers to share their data, even if negative, thereby avoiding wasteful replication. The new rules, to some degree, came about because the 2007 rule requiring posting to the website was rarely adhered to – study results were not timely reported and often were never reported. No one was ever fined or punished. Moreover, the exclusions were so broad that, in 2015, only 9,000 trials out of 200,000 were subject to reporting. Numerous drug manufacturers withheld negative results, arguably making their drugs appear more effective and less harmful. Under the new rules, Phase II and Phase III trials (those that test safety and efficacy) must be registered and publicly reported if they involve a trial in the U.S., a product that is made in the U.S., or trials carried out under FDA rules for investigating new drugs or devices. The trials must be registered within 21 days after the first participant is enrolled and must report findings within one year of completion. The person responsible for registration is either the sponsor of the clinical trial or the principal investigator. Among other things, researchers must report how they carried out the study and analyzed the data, provide the demographics and health status of participants, provide information about side effects if the side effects strike more than 5% of participants, report race and ethnic backgrounds if collected, report adverse effects, and report all deaths, no matter the cause. NIH responded to the 240 public comments received to the draft rules. It reiterated its belief that transparency trumped the added burden the policy imposed and stated that the benefits of transparency would maximize the public’s investment, would increase trust in research, and would contribute to knowledge and the advancement of public health. Previously unpublished trials could provide knowledge and avoid repeating failed or unsafe trials. NIH stated its position that all trials, regardless of phase, benefit transparency and that ClinicalTrials.gov would be able to accommodate trials that are small or exploratory in nature. Resources would be updated to respond to investigators’ needs and evolving clinical research. The efforts of the National Breast Cancer Coalition (NBCC) are well-known in the cancer community. In 1992, NBCC advocated vigorously and helped obtain federal funding for the U.S. Department of Defense (DOD) Peer Reviewed Breast Cancer Research Program. Trained advocates had a seat at the table where research underwent peer review. This helped critically evaluate research proposals and influence the research agenda. As part of NBCC’s Breast Cancer Deadline 2020, the Artemis Project was launched to focus on prevention, bringing together scientists and advocates to help develop a breast cancer vaccine and to identify a strategy to prevent metastasis. One of NBCC’s projects is to train advocates at Project LEAD Institutes and Workshops, to better understand the science of breast cancer and research methodology. Learning how to think critically about science enables advocates to ask hard questions. LEAD graduates go on to analyze research and seek to influence scientific research and government funding.¹ The public expects results, and that means that research endpoints should be meaningful, and not modest goals such as minimal life extension. Whether in response to patient advocacy or merely in an effort to gain political capital, legislation was before Congress in March 2018 which would permit terminally ill patients to access experimental drugs that have only passed Phase I trials — The Right To Try Bill. The legislation would bypass the FDA (the FDA requires Phase II and Phase III trials to take place before drug approval but has a Compassionate Use program which permits the FDA to give permission to patients to use experimental treatment). The Right To Try Bill would allow a person who is terminally ill and has exhausted his/her options for treatment to approach a drug company (with his/her doctor) and seek the use of an investigative drug without participating in a clinical trial. Such legislation passed the Senate previously but did not pass the House. The House bill passed on March 21, 2018, on a simple majority vote. It then was to go to the Senate. However, the Senate did not take it up. As a result, the original Senate Bill was taken up by the House, passed on May 17, 2018 and, now, will be sent to the President for his signature. The legislation was opposed by patient groups, four former FDA commissioners and the present FDA commissioner. Those opposed argue that most of these drugs do not work, that the legislation would allow vulnerable patients to be subject to dangerous side-effects, and that the legislation would weaken the FDA. They also argued that the FDA and those administering the trials know about the drugs, whereas the doctors caring for the patients seeking access know little about their efficacy, safety or side effects. The argument for the bill is that it gives hope to patients who have no other options and cannot enroll in a Phase II or Phase III trial. Additionally, advocates argue that the drug might work and that the drug is already in clinical trial. The Senate bill recently passed by the House, provides, among other things, a requirement that the FDA receive reports of safety events that occur in right-to-try situations and forbids patients from being charged more than the cost of production for the medicines. “Right To Try” legislation exists in 38 states because states have the right to regulate the health and safety of their citizens. New York is not one of those states (Pennsylvania and Connecticut are; New Jersey is not). Moreover, the FDA has expanded policies for access to investigational drugs – i.e., referred to as “expanded access” or “compassionate use” – which gives access to terminally ill patients without other options. Interestingly, pharmaceutical manufacturers have no obligation to provide the therapy sought. The FDA cannot require a company to provide an investigational drug for expanded access use to proceed. A company may decide to turn down a request if, for example it is not able or willing to provide access to an investigational drug outside of clinical trials intended to support marketing approval. To start the panel discussion, Mace Rothenberg was asked to describe how the Bayh-Dole Act changed the landscape for medical research, from his perspective, having previously worked in academia (including at the NIH) and currently working in the private sector. Dr. Rothenberg described the relationships between NCI, academia and private industry as symbiotic. As he explained, the private sector does not do basic research. It does not have the deep knowledge of biology that exists in academia. Private industry uses basic research and its dollars to bring drugs to market. Moreover, from discovery to creation of a useable drug may take 10 to 20 years. Human testing alone requires 8 to 10 years. Dr. Rothenberg stated that prior to Bayh-Dole, approximately 5% of research went into drug creation. With Bayh-Dole, he said that new discoveries increased 10-fold, and he noted that the five-year survivor rate increased from about 45% to 65% in the last 30 years. Fran Visco argued, however, that many of the cancer drugs do not work well, they are overpriced, there are a lot of “me too” drugs, and conflicts of interest resulted from the licensing of the federally funded research results. Ms. Visco also mentioned that while the discoveries may be funded by the government, the money does not flow back to NIH once a blockbuster drug is developed. Judge Moskowitz asked whether private industry would research orphan drugs, e.g., whether there have been clinical trials for the use of aspirin. Ms. Visco noted that there is a U.K. trial with aspirin and another one from the Department of Defense research program. Dr. Norton noted that researchers look for large advances, whereas the benefits from aspirin would be small. Judge Scheinkman questioned what Pfizer considers when it decides to pursue a particular product. Dr. Rothenberg replied that the company looks at (1) whether the drug will make a meaningful difference (except with respect to generics and bio-similar drugs), (2) whether there is an unmet medical need, (3) whether the drug reduces the risk of tumor recurrence, and (4) where the company is placed in regard to the competition. Judge Moskowitz asked about the Sunshine Act – the rules requiring transparency – and whether, for example, it is a conflict of interest if the pharmaceutical company pays a doctor to provide input on its product. Dr. Norton remarked that obviously sunshine is good and that the safeguards assure that those with a financial interest are not involved in analysis of research results. Ms. Visco, however, commented that some conflicts of interests have been egregious and disclosure/transparency has sometimes been insufficient. 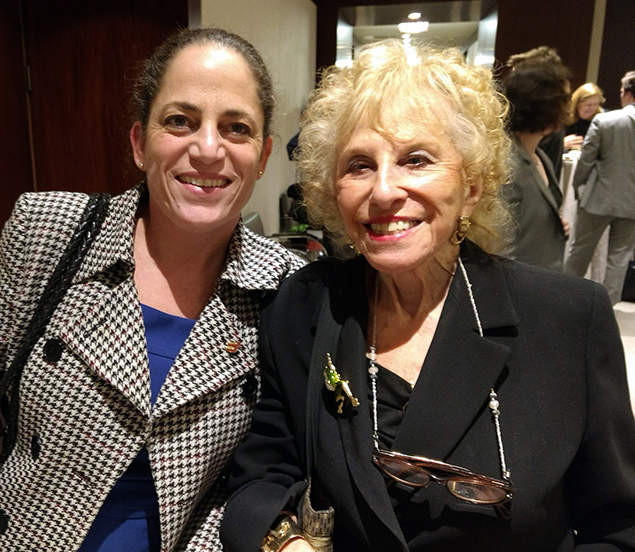 Judges Moskowitz and Freedman mentioned the requirement to register clinical trials at all stages and the “right to try” bills. Ms. Visco reported that most advocacy groups opposed the right to try feature, as did industry and many lawmakers, and that the primary movers were people who were critical of the FDA and wanted to cut out the agency’s role. She argued that many patients who demand access to drugs do so not because there is a scientific basis supporting their belief that the drug will save their lives, but because it provides hope of survival. i.e., industry does not control the process. Ms. Visco acknowledged that there are quality models and then there are other models. Dr. Rothenberg added that, in Europe, where research is more transparent, there is no central research funding agency. There are basic realities for medical researchers, and Dr. Norton pointed out some of these. For example, medical reviewers do not like unpopular topics and ideas that are truly novel may be ones they are unwilling to review. Accordingly, perhaps the very best ideas are ones that we do not hear about. The public does not appreciate the influence of medical publishing. A “proof of principle” is required, and there may be inadequate funding for this. The panelists then discussed the amount of funding for cancer research and whether it was greater in the U.S. than in Europe. Dr. Norton stated that U.S. federally-funded research is the wonder of the world and more funding was needed. Ms. Visco disagreed, stating that the measure of importance was whether the number of ideas was increasing and whether the system was wasteful, not the number of scientists or amount of funding. She further stated that NBCC gave up watching if NIH funding was creating these new ideas and turned, instead, to the Department of Defense breast cancer funding since it was more transparent (because it is focused on only one disease, breast cancer). Dr. Norton challenged Ms. Visco to explain the productivity of the NBCC approach in terms of whether NBCC can demonstrate a reduction in incidence, mortality or morbidity. Dr. Norton emphasized that there is waste in any creative activity and that you have to take chances, knowing some efforts will fail. He further emphasized that, because the research grants are not available, the number of young people he sees going into research as a career has declined. Ms. Visco, however, believes that presently the research money is not well-spent. She referenced an NBCC chart showing the increase in appropriations to NCI over the last quarter century, from approximately $2 billion in 1992 to approximately $5.7 billion in 2017. Judge Gesmer inquired what effect there is on medical care to have such significant funds spent by the drug industry on advertising, particularly direct advertising to consumers. Dr. Rothenberg defended advertising spending as being an exercise of First Amendment rights and a source of information for cancer patients. Judge Freedman followed up with the anecdotal information that patients hear about drugs on TV or from the internet, then request the drugs from their physicians, who may not want to provide these drugs. Ms. Visco explained that advertising by medical institutions is equally problematic – “everyone is happy” in the advertising. She finds it very troubling. Dr. Norton offered that he did not see anything wrong with MSKCC promoting its care on TV or a drug company advertising its drugs. During the question-and-answer period, which followed, an attendee asked for feedback on the advances of Israel’s Weitzman Institute. Dr. Norton responded that, because of the NIH, the scientific advances in the U.S. dwarf what is going on anywhere else in the world. Another attendee asked why there is not more emphasis on cancer vaccines. Dr. Norton replied that the problem with vaccines is that cancer is very heterogeneous, whereas vaccines teach the body to go after one kind of cell. Ms. Visco pointed out that the NBCC website does list various vaccine trials in effect. Another attendee criticized the lack of progress coming from industry since herceptin and aromatase inhibitors. Dr. Norton defended the advances, remarking that all had been made in collaboration with industry, and argued that chemotherapy had saved tens of thousands of lives. Ms. Visco shook her head in disagreement. Both Ms. Visco and Dr. Norton agreed that projects are in the pipeline to prevent recurrence and/or metastasis. 1. The goal of the Bayh-Dole Act was economic – it sought to create companies and jobs. Loise V. Stevens, A.J., The Bayh-Dole Act Turns 30, Sci Transl Med. 2010; 2 (52): 52 cm 27. The Act was enormously successful. Id. In 1978, the government had acquired 28,000 patents; it had licensed fewer than 4% of them. Id. Between 1980 and 2008, 6,652 start-up companies were formed as a result of the Act; university licensed products created 279,000 jobs; biotechnology industries grew up around universities; and academic technology contributed $187 billion to the U.S. gross domestic product. Id. Also, 9% of all drugs approved by the FDA were based on public-sector research institutions, and in 2009, it was estimated that worldwide sales of drugs discovered by public sector researchers equaled $103 billion. Id. 2. It has been argued that unintended consequences of the Act are the creation of a culture of secrecy on campus and a money culture which does not protect the public good or promote basic research. Id. New rules introduced by NIH discussed below, will address some of these concerns. 5. As noted earlier in n. 1, when the government owned the patents, few patents were licensed. There are exceptions to university ownership under the Act. For example, the government may take control of the invention to alleviate health or safety concerns (‘march-in” rights). 6. Adam Rogers, “Scientists Hate the NIH’s New Rules for Experimenting on Humans”, Science (Jan. 26, 2018). 7. Information about the rules, the history of transparency and failure to follow the 2007 requirements is taken from the NIH website and www.statnews.com. The cost of this kind of treatment involves (1) pretreatment testing (CT scans, blood work and other testing to see if a patient is eligible for treatment), (2) apheresis (the patient’s own immune cells are taken for transmittal to the drug company, which weaponizes them), (3) conditioning (chemotherapy is used to start attacking the cancer and depleting the immune system), (4) treatment (the weaponized cells are prepared for infusion and the patients receive it intravenously), (5) post-treatment monitoring and side-effect care (e.g., side effects such as high fever and delirium) and (6) post-discharge monitoring (to evaluate how the patient is responding to the treatment). Typically, hospitals receive a fixed sum for in-patient care provided or a payment for out-patient infusing of a drug, neither of which would cover the costs associated with the CAR-T therapies, described above. Insurance companies acknowledge the benefits of the treatment but argue there is no payment mechanism to allow them to spread the cost over a period of time. Apparently the Federal Centers for Medicare and Medicaid Services has not indicated whether it will cover the drugs involved, and this decision has been made by third party contractors which process Medicare claims, with inconsistent results. Some sources have indicated that there are medical centers across the country which are not opening their CAR-T programs until they get assurances that Medicare is going to pay. This program will also be broadcast on Facebook Live. To register, email rsvp@nullsharecancersupport.org or call (212) 719-2943.